Smoking causes one third of all cancers in Northern Ireland and is our greatest cause of death and disease. It not only increases the risk of cancer for the smoker but for those around them too. Cancer Focus NI’s award-winning Stop Smoking service is funded by the Public Health Agency and offered in GP practices, health and wellbeing centres, community, workplace and youth settings including schools. Our staff help smokers to quit by providing behavioural support and Nicotine Replacement Therapy (NRT). This allows smokers easy access to a range of support methods in one place. We help smokers to create a personal plan for success and look at coping with cravings, managing stress, avoiding weight gain and developing a healthy lifestyle. Our Stop Smoking support service consistently has a quit success rate of 68% in four weeks – well above the NICE guideline of 35%. You can view some of our success stories can be viewed on our YouTube channel. 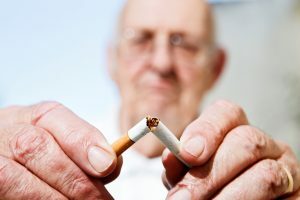 For more details about our Stop Smoking service please call us on 028 9066 3281 or email behealthy@cancerfocusni.org or for more help to stop smoking visit www.want2stop.info.